He’s bearded, bedraggled, has a firm moral compass and is almost three-and-a-half centuries removed from Mad Men’s times. That’s how Vincent Kartheiser has chosen to divest himself of smarmy, conniving ad man Pete Campbell after making the character famous on AMC’s first signature drama series. It’s akin to making a U-turn detour from Twin Peaks to Mayberry R.F.D. 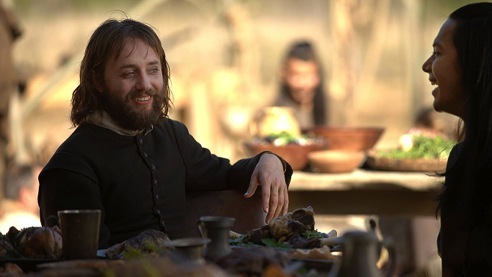 Kartheiser plays future Plymouth Colony governor William Bradford in National Geographic Channel’s Saints & Strangers. The two-part, four-hour production premieres on Sunday, Nov. 22nd at 8 p.m. (central) and concludes on the following night. It’s a detailed and balanced look at how the first “Thanksgiving” came to be, with the portrayals of resident Native Americans a revelation in terms of their customs, machinations and tribal differences. All of their dialogue, save for the English-speaking Squanto (Kalani Queypo), is in the native tongue of the original inhabitants. This calls for ample subtitle reading but also gives the drama a bracing authenticity. Epitomized by Bradford, the “Saints” in this presentation are God-fearing religious separatists who fled England in 1620 in search of lives free from persecution. The “Strangers” are accompanying mercenary employees of the Merchant Adventure Company. “They came for fortune. We came for God,” Bradford says in the opening narrative. But at last there’s land. And huzzahs. And further misery and woes, brought on mostly by disease while the Native Americans consider what to do about these invaders in their midsts. Massasoit (Raoul Trujillo), leader of the fair-minded Pokanoket tribe, vacillates between attack mode and conciliation. Squanto eventually is chosen as the go-between, having mastered the English language after too many voyages as a captured slave aboard various English ships. Saints & Strangers can be a little overwrought at times. But its story also is inspiring, instructive and sometimes quite touching. The vexed but steady Bradford continually must make tough decisions in the face of opposition from the likes of his own military advisor, Miles Standish (Michael Jibson); constantly grousing Stranger John Billington (Brian F. O’Byrne); and the brawny but somewhat less combative Stephen Hopkins (Black Sails star Ray Stevenson). Other principals are initial Pilgrim leader John Carver (Ron Livingston), ad hoc diplomat Edward Winslow (Barry Sloane) and Hopkins’ sometimes volatile wife, Elizabeth (Natascha McElhone). The Native American contingent also includes the elite warrior Hobbamock (Tatanka Means), his wife, Kaya (Bianca Mannie) and their son, Wematin (Nahum Hughes). Saints & Sinners makes a strong visual impression, whether its picturesque vistas or the hard scrabble existence on Plymouth Colony. Death often strikes suddenly, and doesn’t spare some of the main characters. No one is ever entirely safe, rendering the peaceful interludes all the more powerful. The inaugural “Giving of Thanks” is genuinely moving, with Native Americans and the new settlers feasting and playing as one. There are four hours to fill, though, so some liberties are taken. They principally concern Squanto, and whether he may have been duplicitous in his dealing with both the Pilgrims and his own tribe. It adds some rather soapy intrigue while also cementing the bond between the oft-lonely Bradford and his suddenly besieged new best friend. All in all, National Geo should be justifiably proud of this production, which serves Kartheiser well while also telling the companion stories of the people who got to Plymouth first. A satisfying ending leads to an epilogue detailing the further lives and deaths of Bradford and several other mainstays. As governor, he managed to keep the peace for more than 50 years. Unfortunately, nothing lasts forever -- except for perhaps the Thanksgiving Day these Pilgrims birthed.